Hanoi installed security cameras to monitor traffic contribute to strengthening the capacity of the system of urban traffic control, improve the efficiency of control and traffic management. The vehicles violating traffic rules at closing will be surveillance cameras photographed the use of video recording and violations will be conducted in a not too distant future. Currently, in Hanoi, the scientific and technical applications such as using camera enforcement to detect and handle violations not yet effective (there are 34 CCTV, 1 camera). While some other cities such as Ho Chi Minh City, Kien Giang, Bien Hoa City, Dong Nai ... were installed and put into operation successfully with this model. Investment projects installed surveillance cameras at 10 intersections in Hanoi by the city police as an investor is the project contributing to strengthening the capacity of the system of urban traffic control and improve effectiveness control and traffic management. According to a Police Department officers Roads and railways - MPS: "The camera has a deterrent effect people's consciousness when in traffic, has avoided negative in handling violations of some Police The current". 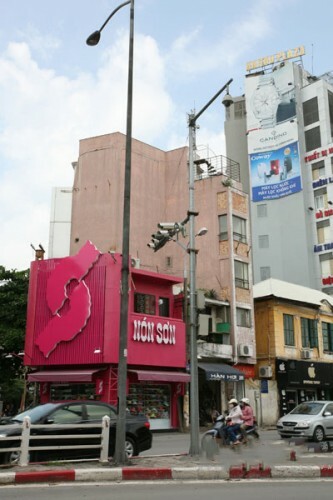 Starting in mid-May 6/2012, Company Silver Sea - a company specialized protective equipment have begun installing the first camera in Dinh Tien Hoang Street, junctions with Le Lai, opposite Ly Thai To flower garden . It was observed that whenever a high-speed ride to run through, camera flash photography immediately flashed back. 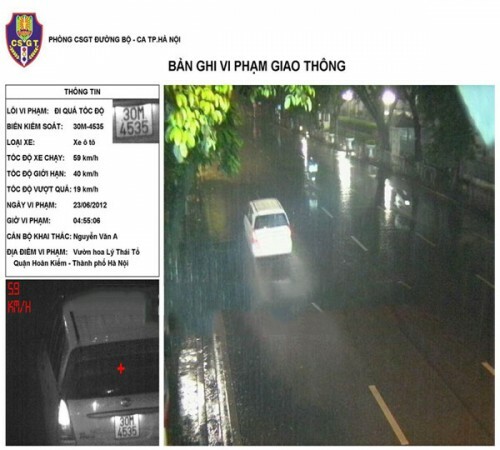 Thus, camera surveillance system has been put into operation, but until you get a ticket in hand, it is at the Hanoi Police official ... cool penalty. According to representatives of the companies, in Hanoi only fitting tested in Dinh Tien Hoang (speed cameras) and the crossroads of the South (red light camera). Test results have been impressive, in 6 days at Dinh Tien Hoang button showed that 482 vehicles and motorcycles both cars speeding limit 45km / h in urban permit. Fine cool ... have done it? Cool sanctions were proposed long ago, but there are still many issues surrounding the collection of fines. Sanctions take a lot of time to cool, after verification of number plates, names violations, address ... Based on pictures, Police will establish violation notices sent to vehicle owners through the local police. After three calls, the offender fails to comply, Police will coordinate with local police enforcement abuses. However, even if the number plate verification, complete name is not the vehicle owner has found a violation, by selling long-dated vehicle not to name, address not identify the buyer, other provinces registered vehicles up to sojourn city ... With such difficulties, original, functional forces will primarily focus on cars, especially taxis, the official vehicles, vehicles of violating enterprise. Anyway, camera surveillance, coercive measures are only minor, the final measures. Above all is for the people themselves still need self-discipline, to raise awareness while in traffic, with or without the presence of the force function.